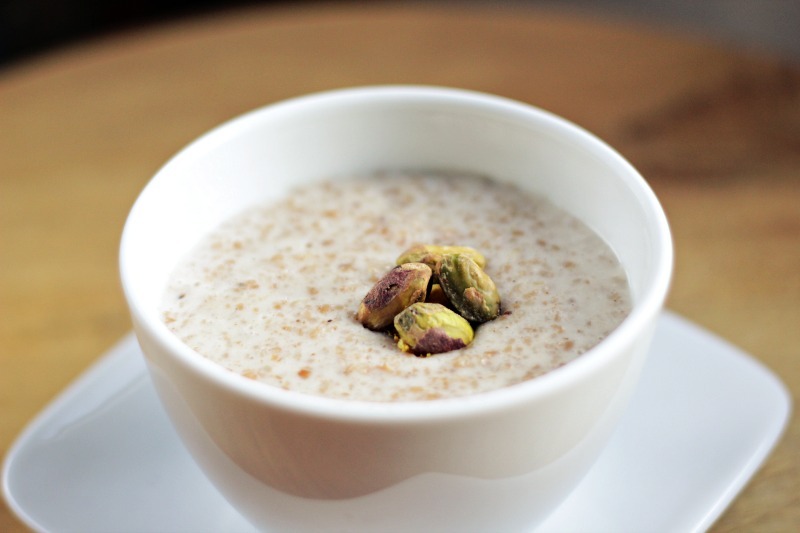 Place the Farro Porridge in a medium saucepan over medium – medium high heat. Toast for 5 minutes, stirring occasionally. Add the salt and cardamom and stir to incorporate. Then add the milk, sugar, and vanilla and stir. Bring to a simmer and reduce the heat so that the pudding is simmering lightly. Simmer for 15 minutes, stirring frequently. Turn off the heat and mix in the cream and rosewater. Let the pudding sit for 5 minutes to absorb most of the liquid. Serve topped with chopped roasted pistachios. *To reheat, just add a bit more milk to the pan or dish with the pudding, cover, and heat over low heat until hot.